← Marketing: How much is enough? Get It Done Right, Get It Done Fast! Author Rhonda Abrams has developed over the past few years, a series of best practice, and common-sense books for small business owners. Each of these publications offers up good mix of lists, pull out quotes, and enough graphs and charts to make even USA Today blush. The end result is a how-to book rather than a compelling philosophical read. But, for those of us who are tired of the rhetorical blather and wish to simply cut to the chase, Abrams’ books are just the ticket. “Winning Presentation in a Day” may not solve prevailing “Death by PowerPoint” practices that pervade meetings and seminars, but they give it a good shot. The book in fact spends plenty of time and space introducing and explaining the details the PowerPoint program for the novice user. What “Winning Presentation in a Day” does right is point out the essential elements of presentation that will provide an audience with a few strong take-away points, rather than a head exploding reams of information. At the core of the book’s lesson is the simple act of taking yourself somewhat out of the presenter’s role and simply thinking more of the audience’s perspective. And it’s amazing how far a little empathy can go. “Winning Presentation in a Day” shines as a comprehensive beginning-to-end resource book for producing a superior presentation in a short amount of time. This includes all-inclusive sections on gathering content, refining content, different speaking styles, audience interaction, working with visual aids, trouble shooting (appropriately titled “When Good Presentations go Bad”) and of course …PowerPoint. I should explain that neither the author nor I am slamming the idea of using the PowerPoint program, but rather we are in agreement that PowerPoint’s attributes, bells and whistles should not over used to the point that they detract from the speaker’s overall objective. What should be emphasized is the preparation of relevant content that an audience will learn from and providing something useful to take back to others. In short, all of us know bits and pieces of what makes a good speaking presentation. 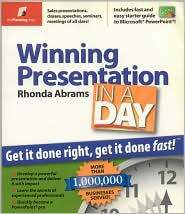 “Winning Presentation in a Day” is thorough enough that is covers any of the areas that we might be deficient in. A spellbinding business classic this in not, but for its intention of being the ultimate guidebook in perfecting a presentation, “Winning Presentation in a Day” is spot on. Wrap it Up: Your audience has agreed to take time out of their lives to attend your presentation. Respect that and try to end on schedule. Don’t hold your audience hostage with an extended question session that goes way over the allotted time. While some may hang around to be considerate, they’ll leave with a negative memory of your session rather than a positive feeling about your message. Chris Wendel is the Regional Director for the Michigan Small Business & Technology Development Center (MI-SBTDC). The MI-SBTDC offers business counseling, entrepreneurial education, and technical assistance for established and emerging businesses in the Grand Traverse Region. This entry was posted in book reviews, Northwest Michigan, small business trends. Bookmark the permalink.